Radiance There are Multiverse/Kosmology instruments for each of these sample collections, as well as an ALL which gives access to them all, SYNTH which just uses the more traditional synth type sounds and Pads, and finally FX which compiles the wilder collections. Classics represents excellent value for money due to the sheer amount of diverse samples and the almost endless ways they can be used and Sequenced. 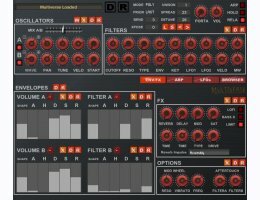 True Dual Synth – Each Synth now has it’s own Filter in comparison to Kosmos which shared the Filter Cutoff and Resonance controls. Kosmology is an Advanced Sequencing System designed with Live performance in mind. It has 8 Sequencer Instances which can be switched on the fly from your midi controller. Each Instance has independent control over 40+ parameters with 5 freely assignable destinations from a list of over 40. Each Sequencer also has independent tempo and step size which opens up almost endless possibilities. The Sequencers can be played like a regular instrument and are also polyphonic. The greatest feature however is the ability to Sequence the Waves (sampled instruments) themselves which brings a unique and instantly inspiring ‘sound’ to the sequence. There are also a series of live midi note triggers designed for manipulating the tempo and sound during performance, a Globals section designed for offsetting parameters across all instances which support VST Automation. There are also 3 programmable triggers which can apply offsets to parameters when the relevant midi note is held, and finally there is a Rescaler for forcing sequences to a specific scale for each note in the octave.